IAN MCAULEY. Australia’s finance sector: a bloated overhead? Rather than capricious and populist measures such as the government’s levy on the big five banks, we need a thorough and far-ranging consideration of the role of the finance sector in our economy. This sector, which should have benefited from productivity improvements to reduce its costs, has become an increasingly bloated overhead, whose growth has provided little if any real value. In my post-budget contribution to John’s blog, I criticised the government for its imposition of a levy on the banks. My criticism is not based on any affection for the banks. Rather, it has to do with the process, or the lack or process, by which the decision came about. The Treasurer’s budget papers mention the levy – it is prominent in his budget speech – but nowhere is there any mention of the reason for the levy or of the process leading to the government’s decision. Why is there a levy on bank liabilities and not, say, on bank profits? Why only the five biggest banks? 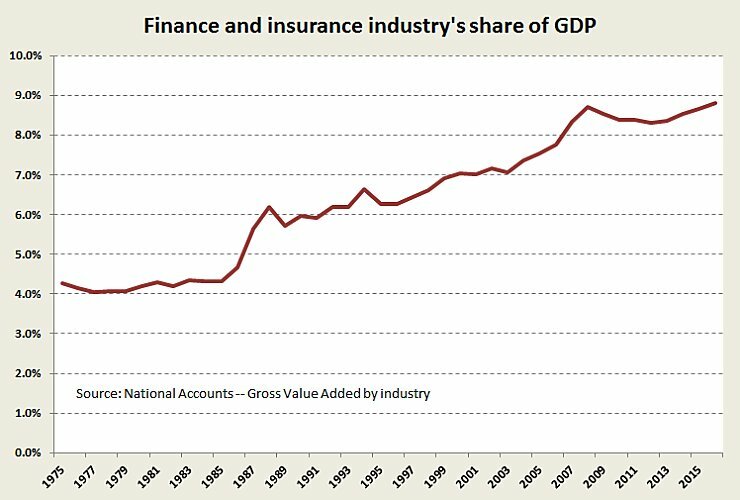 Why on banks and not on other parts of the financial services sector, most notably insurers? Only some time after the budget did the Treasurer try to frame the levy in terms of financial stability, linking it to the government’s protection of depositors’ balances when there is a risk of a run on the banks. The Rudd Government introduced a temporary deposit guarantee in 2008, at the time of the financial crisis. The guarantee has since become permanent (albeit at a lower level: it was $1 million when introduced; it is now $250 000). This sounds more like an ex-post justification than a considered reason. Unsurprisingly the levy has been well-received by the electorate, as confirmed by opinion polling , and apart from the banks themselves there have been few voices of criticism. But if there is one strong lesson from the events of the past year, populism is not a sound basis for public policy. Process counts. We have established processes for economic policy changes, most notably through the Productivity Commission, which in its various names has been one of our central institutions for almost 100 years. (Its incarnation was in 1921 as the Tariff Board.) The Commission’s public inquiries allow parties to air their views and warn about the complexities of policy proposals. (It is adept at anticipating unintended consequences of what look like good proposals.) And, more importantly, it can bring to account the economic efficiency and distributional consequences of policy proposals. If a policy issue calls for an inquiry involving the compulsory attendance of witnesses, where perhaps there has been malfeasance, the government can convene a “royal commission” (to use our quaint colonial language), as the Labor Party proposes for the finance sector. Sometimes, when there is a major structural imbalance in the economy, we need an even more basic policy process, similar to that undertaken over many years by the Hawke-Keating Government when it steered through a fundamental re-examination and re-direction of the policies around manufacturing. Australia’s financial services sector is the largest contributor to the national economy, contributing around $140 billion to GDP over the last year. It has been a major driver of economic growth and, with 450,000 people employed here, will continue to be a core sector of Australia’s economy into the future. Is it “the largest contributor”, or is it really “a large overhead”? What do those 450 000 people – many of whom are extremely well-paid – really do for us? Forty years ago, when we wrote cheques, when ledgers were updated by hand, when bank statements were sent out by post, when credit cards hardly existed, when every suburb and village had to have a bank branch, we got by with a finance sector that absorbed only four percent of GDP. Even though this sector has been the prime beneficiary of information and communication technologies, its GDP share (which is essentially a measure of the sector’s costs) has doubled, as shown in the figure below. Yet the business of finance is still the same as it was in 1975 – connecting savers and borrowers, and providing means for safekeeping of financial assets. Unlike, say, the auto industry which has brought us safer, more comfortable and more reliable cars, the finance sector brings us the same old products, just with a little more convenience. As Paul Volker said “the only thing useful banks have invented in 20 years is the ATM”, and even that is now on the way out. By the simple rules of productivity diffusion, the sector should have shrunken in size. The explanation for its growth is likely to be in terms of new or more costly functions that confer little if any consumer value – or even a net cost to consumers. It is telling, for example, that the growth in the finance sector has coincided with the growth of household debt. Car loans, store finance, credit card finance and payday loans are all subject to usurious rates of interest. Those are the direct consumer costs. They do not include costs passed through to us indirectly, such as the financial costs of public-private-partnerships. And the $140 billion national accounts figure does not include costs the finance sector imposes on other sectors, particularly legal costs. The only shortcoming in Labor’s proposal for a commission is that such a process would not go far enough. We need to ask what, if any, benefit we have gained from the huge expansion of this sector. This entry was posted in Economy, Politics and tagged Banking, Finance, Ian McAuley, Productivity Commission. Bookmark the permalink. 3 Responses to IAN MCAULEY. Australia’s finance sector: a bloated overhead? One could also look at the cost of The game of grey corruption we are seeing – which is unethical, yet often very much legal – is a play for an unearned part of our shared wealth that takes place deep in the halls of Australia’s largest companies, and in our parliaments. Couldn’t agree more Ian. I think I have read that prior to the GFC the finance sector made up 40% of the US GDP. Anyone who isn’t employed in the sector would see that this is a measure of waste/overhead, not an investment in productivity. I have long looked at the profits of banks as a tax that citizens pay for the privilege of moving their money around, no more no less, and high profits in banks should be seen as sclerosis around the heart of the economy. Then there is the finance industry ex-banks, the superannuation sector sucking every last drop out of our retirement savings, and the exorbitant costs of insurance, in particular home, car and health. We are being gutted by a swarm of vampire squids.